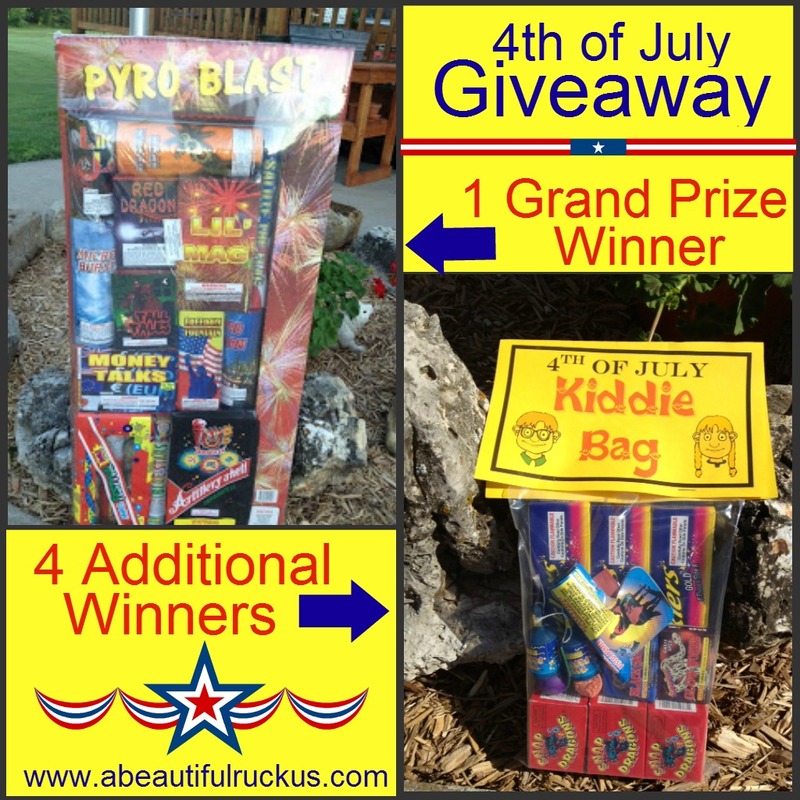 A Beautiful Ruckus: Independence Day Fireworks Giveaway! Yay! It's fireworks season again! I always look forward to Independence Day! This is my 7th year spending the week before our country's birthday in the big yellow and white tent. I really enjoy getting to do this, and I am beyond appreciative that Sean makes it a priority to let me have the week "off" so that I can go work the tent. 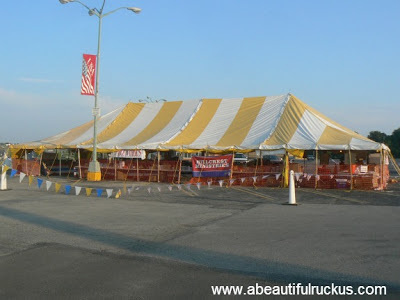 Last year, the Lee's Summit/Hillcrest Fireworks Tent offered an awesome giveaway through this blog along with a discount for an A Beautiful Ruckus readers. I've been chatting with the tent operators over the last few months, and guess what? 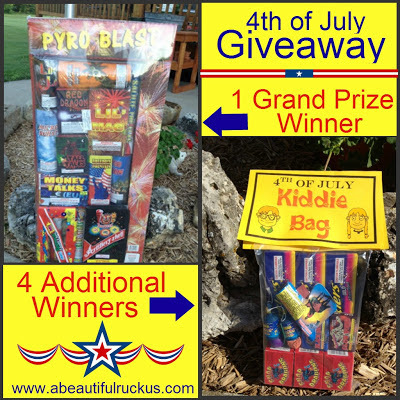 They are totally on board with letting me giveaway more fireworks this year! The tent I always work with partners with Hillcrest Transitional Housing. It's a ministry in our area that works with families who don't have homes. They help them by providing a place to live, basic life skills education, and the encouragement to find a full-time job. It's a 90 day program that offers a hand up instead of a hand out, because their goal is to get these families back on their feet. They have a 95% success rate, and are doing some fabulous work in our community. Wonderful! Odds are that you will be purchasing fireworks somewhere this season, and I hope that you will consider doing so at the Lee's Summit/Hillcrest Tent. All military, civil service, and homeschoolers get 10% off as an extra incentive! Your money will be benefiting something far more worthy than overhead at a big box store....plus, you get to meet me! I met several blog readers last year and had a blast! So, now that I have you on the hook, let's get on with some fun stuff! Ready?? First, all A Beautiful Ruckus readers will receive 10% off any purchase! Just mention that you are a reader at the checkout counter! Save a little money, and know that you are partnering with a great ministry! On top of that, you can enter to win one of FIVE prizes! Four readers will win the Kiddie Assortment Packs! It has snappers, sparklers, poppers, and some other fun things to entertain younger kids! One Grand Prize Winner will receive the Pyro Blast Fireworks Party Package (or a package of like value) that contains all sorts of items to get even the dads excited! This party package retails for $75! Just as a side note, the lady who won this last year has a husband and four sons...let me tell you who was queen of the house when she brought that home! All you have to do is enter below, and then of course, come see us at the Big Yellow and White Tent in Lee's Summit! And definitely don't forget to mention that you are A Beautiful Ruckus reader to snag your extra discount! To enter the Lee's Summit/Hillcrest Fireworks Giveaway, please use the Rafflecopter widget below to enter. The first two tasks are not optional and must be completed to qualify for this giveaway. If you choose the "anonymous option" to comment, please at least include your first name and first letter of your last name. It's impossible to verify comment entries without names! The additional entry tasks are optional. Winning entries will be validated prior to announcing the winner with an alternate drawn if the entries cannot be verified. The contest ends at 11:59pm on Monday, June 21st. The winner(s) will be randomly chosen and contacted by email on Tuesday, June 22nd. The winner(s) will have 48 hours to respond to the email to confirm that they received it. 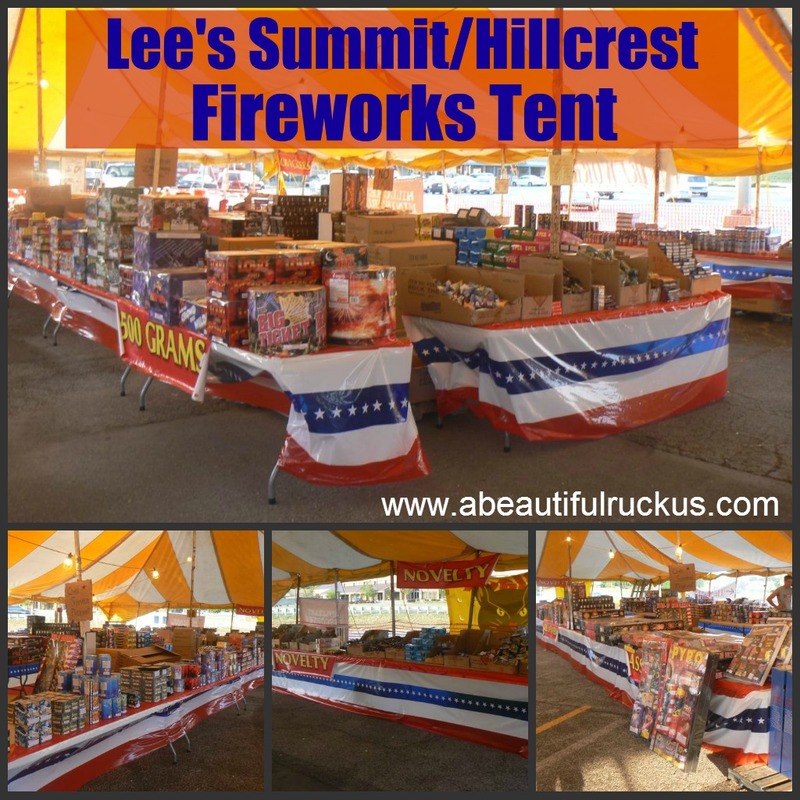 All prizes must be picked up in person at the Lee's Summit/Hillcrest Fireworks Tent location. Due to laws restricting the shipping and distribution of fireworks, we are unable to mail the prize. This giveaway is open to residents of the United States. For more info, please see my disclaimer page. Keep an eye out for the Ishum Quads this year as well! They will be making another appearance in their red, white, and blue wagon...although they are a whole year older now. *sniff! * Pretty soon they will be working the tent with me! My favorite part is grilling out with family and friends! I love swimming, eating great food and watching the fireworks! 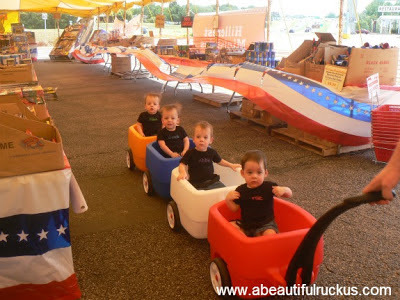 We love to camp in Branson for the Fourth of July! They have a terrific fireworks display! Can't wait to see you there Becca! My favorite part is getting together with my family and watching my children's faces when they watch the fireworks. My favorite part is getting outside to enjoy the fireworks. I love being with lots of family. We have HUGE get togethers! Eating and coming up with fun new dishes that are creative just for the 4th and just everything! I love getting to spend time with my family! Hugs and love from New Brunswick Canada! A day off work and the food! I love celebrating the Fourth of July because my husband's Birthday is on the 3rd of July, so we always get together with his family and have lots of fun. The kids enjoy the food and the fireworks and lately I have been trying my hand at fun photos of them! What I love the most is hanging out with family. My husband's Birthday is on the 3rd so we always get together and there is lots of food, fireworks and FUN!! I like watching the annual firework display out at the main park :) I live in a small town called Adrian, Missouri .. is the Lee's Summit fireworks tent displayed here in Missouri by chance?